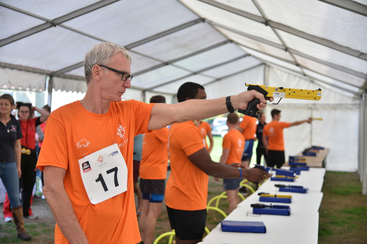 After the success of the inaugural event in 2017, the 2nd PentUp Challenge enabled sufferers of Post-Traumatic Stress Disorder (PTSD) to once again take part in Modern Pentathlon in a friendly environment. The Royal Military Academy in Sandhurst (GBR) played host once again to 36 Pent Up entrants and also incorporated the Army Modern Pentathlon Championships. PentUp was founded by combat veterans Dr Simon Thompson and Jon Pallas and the competition Is organised by Sue Hyde, former competitions director for Pentathlon GB. It uses the sport of Modern Pentathlon for the therapy and treatment of serving and retired British Military personnel who are affected by PTSD. The format and scoring system had to be adapted for a huge age range (20 to 63), with abilities varying from novice to Olympian. Most had no experience at all and trained for all five disciplines in the previous six months. Dominic Mahony, Great Britain Olympic team bronze medallist in Seoul in 1988, said: “The organizing team did a superb job, the day ran like clockwork and had a wonderful atmosphere. Founder Jon Pallas added: “Many thanks to all the discipline directors and event officials for making the Pent Up 2018 Challenge such a brilliant event.